If it seems unlikely that Judas betrayed Jesus because of money or evil possession, could he have been turned by a simple story? I’ve always been troubled by the depiction of Judas gets in the Gospels. Every Gospel treats him differently. Matthew and Mark write that Judas was motivated by gold and greed, whereas Luke and John say that Satan tricked Judas or took over Judas. John includes a line where Jesus tells Judas to go and betray him. Judas even dies differently. In Matthew, Judas hangs himself in shame, while in Acts, Judas trips in the field he bought with his blood money and injures himself in a way only suitable for the TV show The Walking Dead. But each time I read Judas, I can’t get past the passage in Luke 22. Let’s examine the story narratively, taking the story as true to see what it is trying to say. 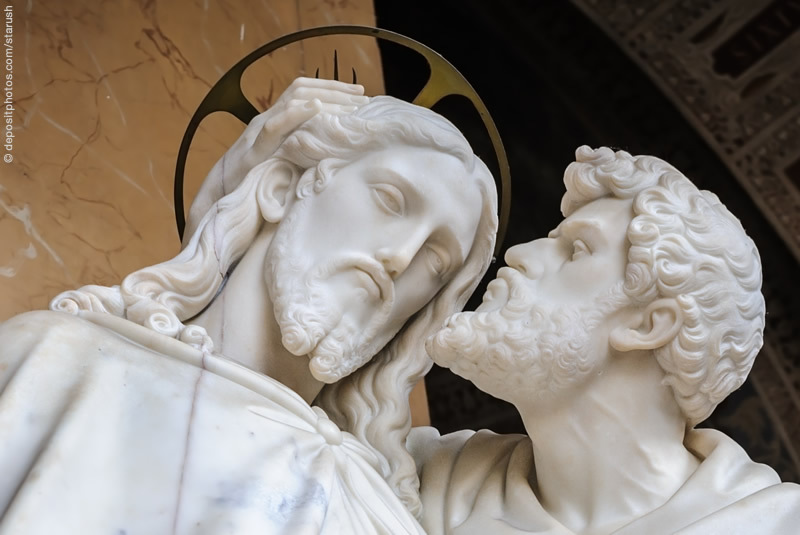 Judas is minding his own business, and then “Satan enters into him.” Yet Judas doesn’t appear to become like the demon-possessed folks elsewhere in Scripture. Judas kept his sensibilities. So we aren’t talking about a possession where Satan overpowers Judas’ facilities. No, I think the story makes the most sense if Judas “turned” whereby he willingly followed what Satan said. Satan convinced Judas to turn against the most powerful and wonderful person on earth, whose miracles Judas saw with his own eyes, whose wisdom Judas knew intimately. What could Satan have possibly said to Judas to turn him in the face of that proven power and authority? Our clue is that Judas was Jewish. He participated in the Passover meal, along with all the other Disciples who were all Jewish. Judas, more than likely, grew up going to the synagogue and hearing the stories of the faith, especially the stories of the patriarch of Judaism: Abraham. Abraham and Sarai were wicked old and God blessed them with Isaac, their only son, and God said their descendants starting with Isaac would be the chosen people. Judas would have heard the most dramatic story of Abraham over and over. You may know it in Genesis 22. God told Abraham to take Isaac up to the top of a mountain and sacrifice him. Abraham took Isaac up the mountain, tied him to a sacrificial pyre, and had a knife in his hand when God intervened and stopped him. Isaac lived, and Abraham was rewarded for his faith by becoming the patriarch of the Chosen People of God. Judas knew this story, had to know it in his bones, and be able to recite it word for word. “It is said that Abraham acted with absolute fidelity to the call of God; that despite his deep love for Isaac and his sense of correct ethical conduct, Abraham was prepared to follow the dictum of God regardless of the consequences. Although Abraham loved his son and believed that he was to be the arch through which his descendents would enter into the world, Abraham obeyed God and resolved in his heart to commit the murder. I wonder if Judas thought he was being told by God to give Jesus up so that Jesus could become who Judas thought he was. Judas thought he knew how that story would work out. Jesus would save himself when the Romans took him into custody. He would reveal himself as the warrior king, the Messiah, and the Empire would be vanquished. Judas would have proven his worth as Abraham did, willing to sacrifice their one hope. Judas would have been the most faithful disciple there ever was. I wonder if that was the story ringing in his ears. Except that didn’t happen. Later from this passage and in readings during Holy Week, we know that Judas brought the soldiers to Jesus’ camp, but instead of a dramatic reveal that overcame the empire with shock and awe, Jesus would be arrested, crucified, and killed, the disciples scattered and afraid. Little wonder Judas would take his own life in Matthew’s Gospel. Jesus wasn’t who he thought he was. The one who Judas loved was gone. Judas got the story wrong. Judas was not meant to be the Second Abraham. Instead, Jesus was meant to be the Second Adam. The First Adam was made of the dirt, and even though he sinned, God loved the one he made with dirt. The Second Adam, now, He one who would make things right, who would track dirt into the all-too-clean temples, past the whitewashed tombs of the Pharisees, and connect humanity with God directly again. Rather than a second story of a favored family made anew, it was a new story of the entire human condition made anew. The Second Abraham was a failure. The Second Adam was not. I get this Judas. I don’t get the one who was controlled by Satan, or even gave up Jesus for some silver. Those don’t make sense to me. But a human who fell into the trap of mistaking others’ voices for the voice of God? That I get. I also get caught up in a story that is not my own. We all do. So often we betray our own lives by living into stories that are not our own. We believe we are supposed to be all things to all people: the superparent, partner, and breadwinner who does everything in 25 hours a day. The one whose talent will take them to the highest levels of prestige. And when we don’t make the list, we don’t get the promotion, when our children don’t respond the way we expected, and when our beloved seems ever more distant, we wonder what went wrong. We can get so wrapped up in our own stories that we forget who we are. Humility is the final frontier. You spend all your life building a persona, and the rest chipping away at it. Lots of people get lost in the selves they build and are desperate to get out. How many of us are lost in the selves we’ve created, the stories that we listen to that are not true, and want desperately to get out? How tragic is it that Judas got so lost in his image of Jesus that he couldn’t see the real one? We see that maybe the Second Abraham and the Second Adam both existed at that moment. Judas failed the test by, probably, 24 hours. If Judas had lived long enough to see the Resurrection, would he have been venerated? Forgiven? And I can’t help but wonder how strong Abraham would have been if his knife hand was unhindered and struck true. Would he have responded like Judas when his dream was crushed, when his story didn’t match reality, and when he was unable to get out of the swirling darkness? Maybe we are all living out the twin stories of Abraham and Judas, both discerning God’s still-small voice amidst the chaos, terrified at every moment that we’ll mistake it and live a story that isn’t ours. That’s a lesson of Judas that I can take to heart. Over the years I have pondered Judas and his betrayal of Jesus as presented by the gospel accounts. I like the perspective and lens offered here by Rev. Jeremy Smith. I’ve been able to make sense of the passage, just not constructively. But this? This was powerful and convicting, not just constructive. Thanks for listening to the Holy Spirit. I lead a conversation on Judas last night with some fellow students. This fits perfectly into and further enriches our conversation. Thank you very much! I’ve never heard someone parallel Judas and Abraham. There are far more parallels between Mary and Abraham. Both receive divine announcements of miraculous births and promises of widespread blessing through their children. Both respond to angels with, “Here I am.” Both attend the killing of their sons, only Abraham’s is spared. In my reading, I think the New Testament intends for us to understand Mary as the New Abraham (calling her our common mother in Rev.12:17, and the mother of the disciple at the cross in John 19). We are all Mary’s children, but Protestants are somewhat allergic to viewing Mary so highly, so we usually don’t make that connection. I don’t know Rollins’ background, other than fancy death-o-God parable writer and philosopher. I think his parallel between Judas and Abraham is interesting, but I don’t think it’s necessary. You could get the same conclusion if you link “Satan entering Judas” with Satan’s 3rd temptation in Luke 4, where Jesus will be saved by angels and proven to be the Messiah if he is threatened with bodily harm. The only reason I’d rather link it to the temptation rather than Abraham’s call to sacrifice Isaac is my believe that we have a New Abraham in Mary, mother of us all, and she did not fail. Blessings, Brother! Good, informed comments, Ric. I actually think both Abraham and Judas were failures (in a sense) but that writeup is for another day. I had never made this leap in connecting Judas to Abraham before, but I think this is where I’ve always been heading. I was never satisfied with the usual explanations for Judas’ action. I always kind of lived with the idea that he had to do this or there would have been no resurrection, but that negated free will. This makes sense to me. For years, I have thought that Judas really got a raw deal in the telling of this story. It was foretold that Jesus would be betrayed, and without Judas, we would have no resurrection story. I had not heard this approach to it, but I had heard another theory that Judas was instructed by Jesus to betray him so the prophecy could be fulfilled. Thank you for this writing. Excellent. I have struggled with the Judas story for so long. I have spent much time comparing Peter and Judas. Never have I made this connection. Thanks! I too for many years, I’m now 57, have struggled to try to make sence of Judas’s betrayal of Jesus. The only answer that I could conclude was that he did what Jesus told him to do. I know that Jesus was alway Jesus and as the son of God, he knew his mission was to be crucified for our sins. So God knows all… So Jesus knows all and yet he still choose Judas the betrayer to be one of his disciples. This makes great sence to me that indeed Judas did think, like the other disciples, that the kingdom Jesus spoke of was going to come about immediate upon Jesus’s entry into Jerusalem on Palm Sunday. When that did not happen satan could have sujested to Judas that he needed to help Jesus fulfill Gods plan. It also makes sence to me that not seeing the heavenly angels come to Jesus’s aid and Jesus become what Judas and the other disciples wanted Jesus to be, that Judas became discouraged. As an Anglican who, like Wesley, has Orthodox leanings, I think the answer is simple: Judas had turned to evil, before Satan entered into him. The Gospels recount him objecting to Mary of Bethany washing the feet of our Lord with fine perfume, but Judas objected, claiming the money should be spent on the poor. But his motives were sinister; he was embezzling. Ergo, Judas was already betraying our saviour. And by making himself an enemy of the incarnate God, he invited Satan into Him, and willingly participated with Satan in the betrayal of Jesus Christ. We have two choices in life: we can try to do good, by believing in God; our faith is empowered by divine grace, and in turn we receive additional strengthening grace by receiving the Holy Spirit at Baptism and partaking of our Lord at the Eucharist. Thus, we alogn ourselves with God; in Methodist parlance, we engage in sanctification, the goal being total sanctification, or what the Eastern Orthodox call theosis. “God became man so that we might become god,” wrote St. Athanasius. We become throu(h (race what God is by nature. This, by the way, does not mean Pelagianism or sinless perfectionism; Wesley didn’t teach this, and neither did Athanasius, the Cappadocians, Gregory Palamas or Thomas Aquinas, the other key thinkers in this line of soteriological inquiry. Or, alternately, we can ignore our conscience and do what feels good. We can live irreligious lives, like so many lawyers, politicians and businessmen, and criminals. And when we do this, we align ourselves with Satan and let Satan into our hearts. Thus, just as God prompts the Christian to pursue ever greater acts of piety and to move ever closer to entire sanctification, the devil encourages us to become ever more depraved; he enslaves us by our passions, appealing fo our carnal instincts amd desires amd using this to manipulate us to greater depths of evil. Judas voluntarily began to give himself over to Satan when he started embezzling the treasury of the Apostles. His betrayal of our Lord I think is an act of diabolical synergy, a voluntary union of God and the devil. It was a mirror image of the many miracles worked by the Apostles and the saints of the early Church in synergy with God. This does not rule oiut your odea. Frequently, people in align,ent eith the devil have delusions of religious sanctity and importance. Muslim suicide bombers from ISIS consider themselves to be holy martyrs. So your idea about Judas’s thought process is interesting; I don’t think it in any sense conflicts with the idea of the devil having entered into Judas; Judas invited him in with his perty theft, and the devil probably prompted him with the delusion that he was the new Abraham. This is not uncommon. If you read The Sayings of the Desert Fathers, The Ladder of Divine Ascent, the Philokalia, or the Arena of St. Ignatius Brianchaninov, you find this sort of thing with alarming frequency. On several occasions demons, posing as angels, flattered monks. Some monks were wise or fortunate and drove them away, or were rescued by their brethren. Others however were deceived into believing they had become like angels, and several monks in the history of Christianity died by jumping off cliffs, thinking they could fly. Now that the UMC has a convent and the quasi-monastic Order of St. Luke, I think Methodists will begin to have these kinds of experiences, so we have to view Judas as the ultimate cautionary tale. Can a Study Qur’an or Study Bible Stop Extremism? Does The Eclipse Solve a Biblical Conundrum?